When the time comes to pick a monument for a family member or loved one, you'll have many different options available - but none of these choices are as renowned or long-lasting as hand-carved memorials. 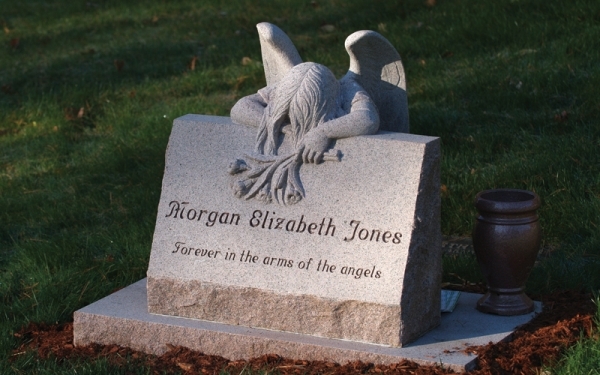 Our team is experienced enough to create any figure or figures into both granite memorials or headstones that help to create a one-of-a-kind monument that is beautiful, timeless, and honoring to the deceased. Throughout the years we have provided our granite headstones all throughout Queens NY and New York, including cemeteries such as Greenwood Cemetery in Brooklyn, St. Johns Cemetery in Queens, St. Charles Cemetery in Long Island, and much more. Upright headstones stand tall from the ground up and can be made out of various materials such as granite, brownstone, glass or marble. Most upright monuments today are crafted out of granite due to the natural strength and durability of the material. Flat headstones are often referred to as ground-level headstones or grave markers. These headstones are flat and typically sit a couple inches off of the ground. Flat headstones are also commonly used as foot stone to a larger family monument. There are many variations of slant-style grave markers. Cemeteries have specific rules and regulations about the sizes of slant that can be used. A slant monument is normally low to the ground, lifting only 1-2 feet high, with the polished face sloping at about a 45-degree angle. Slant memorials are always supported by a foundation, which raises the slant marker off the ground as to not hide the lettering. The inclined inscription surface of slanted headstones not only contributes to the prominence of the inscription, but also, unlike the flat or flush marker, it sheds the rainfall and nature keeping it clean. We employ the area's finest engraving experts to ensure that your loved one's memorial matches the quality they deserve. Our team can handle letters that are knife-cut, frosted outlines, hand-tooled or hand-drawn, and many more styles. This is what distinguishes us from many other monument shops, and has helped keep us around since 1951. 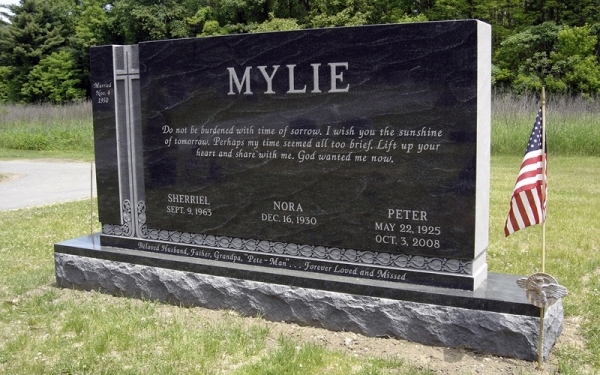 Most headstones, monuments, and tombstones are engraved with sandblasting techniques, but Supreme Memorials is one of the few companies on the east coast that has the expertise to match the classic timeless hand-carved stones that has been used for thousands of years. Once the team is on site, we carefully review our worksheets, the contract, and the cemetery permit to verify the information we have on your engraving request. Our carvers then mask the monument with the stencil and transfer the letters and numbers onto it before carefully cutting the lines with a sharp stencil knife. When the material from carving the letters is removed, these open areas are then sandblasted with silica sand until they are the same depth as the surrounding letters. If the work requires hand-carved lettering, the process is slightly different - we still protect your memorial and we still use a template, but the letters are cut using a hammer and a chisel. "I wanted to send you a personal thank you for the job done on the Armellino grave stone at St. Charles Cemetery. Simply said the work is outstanding. My family and I appreciate the great job that was done and will recommend you to everyone we know as its very hard to deal with these things in life but you made it much easier. Thanks again for all your help and support in getting the job done." "Your staff at Supreme Memorials did an excellent job inscribing our dad's name on the tombstone in Resurrection Cemetery Staten Island New York. Unfortunately, my dad passed only one year after you mad the stone for my mom. I really appreciate the personal service you gave to us, but I hope never to have to use your service again (really LOL) but if I do need a monument or if a family member or friend needs this type of service I will highly recommend you." "I can't begin to tell you how pleased we are with the monument you designed for us. It is absolutely beautiful! The workmanship is outstanding!" 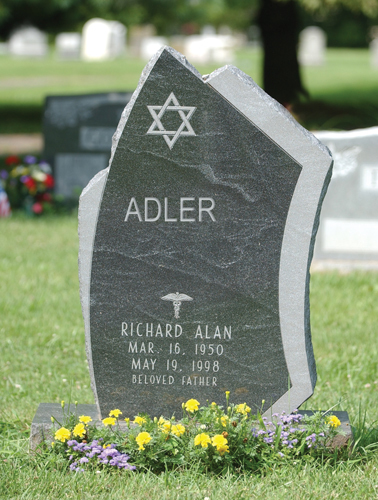 Supreme Memorials has the largest selection of custom and stock granite headstones at your disposal for when you need them for your loved one. For questions regarding our process or designs, contact us as soon as you can. We try to make this process as easy for you as possible. Proudly serving the Queens NY area, don't hesitate to contact us today!